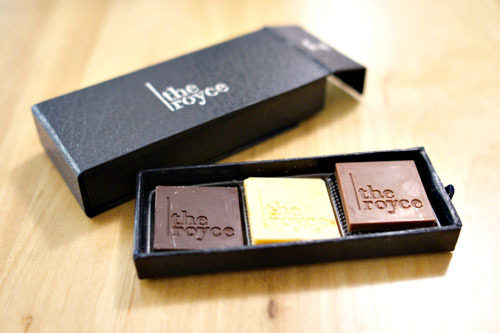 The Royce continues to impress, and my friends liked the restaurant's recent truffle menu so much that they were eager to return. 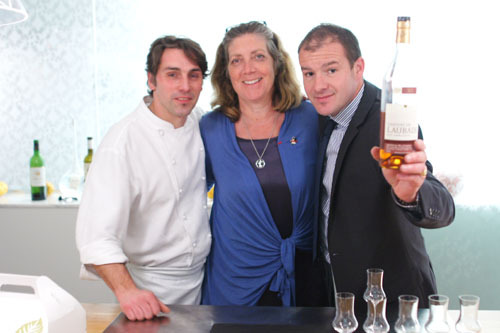 A special dinner celebrating the terroir and cuisine of South West France was the perfect opportunity to give the place yet another go. Co-hosted by special guest "Ms. Foie Gras" Ariane Daguin, founder of artisanal meat purveyor D'Artagnan, the night featured Chef David Féau's take on foie gras, cassoulet, and other regional specialties from Gascony and its surroundings, complemented by wine pairings from GM-slash-Wine Director Eric Espuny. 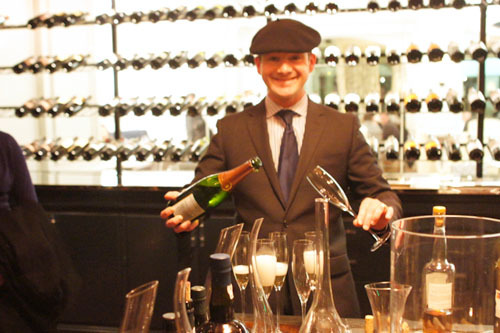 We started off with a reception in the wine room, where we enjoyed a bottle of Ployez-Jacquemart Champagne Extra Brut Passion and chatted with Espuny, himself decked out with a beret in true Basque fashion. 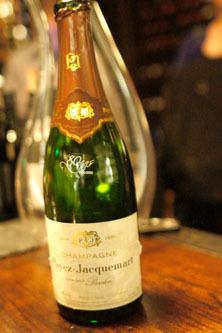 The bubbly was lovely: delightfully dry, with keen notes of apple and stonefruit along with a clean acidity. The standard menu for the evening was a six-courser priced at $95pp, plus $55 for wine. 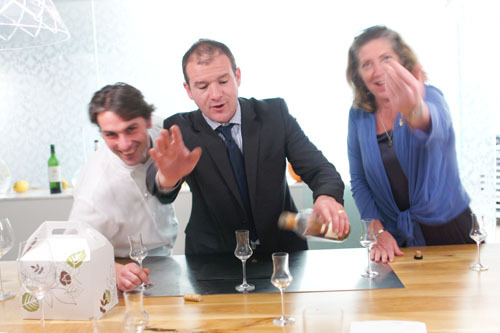 However, given that we were seated at the Chef's Table, we opted for an extended 11-course degustation at $180pp plus $70. Click for a larger version. Les Amuses de Musketeers comprised four little bites. First up was a tartare of bonito with guindilla piment des Landes: think light, bright, refreshing flavors, with a perfect touch of Basque heat from the peppers. We also enjoyed a Russian banana potato sphere on a stick, coated with Bethmale cheese and bacon. With this one we were talking classic, savory flavors in a hot and hearty package. 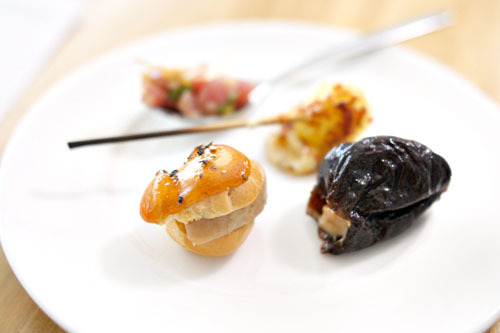 A peppercorn-glazed foie gras croque-en-bouche was tasty as well, with a great interplay between sweet, peppery, caramelized flavors and the earthy, lingering essence of the liver. Finally, we had a foie gras torchon encased in an Armagnac-soaked pruneaux d'Agen, with showed off a faultless interaction between the sugary fruit and lush, luxurious foie; Féau calls this his "French Kiss," and rightfully so. 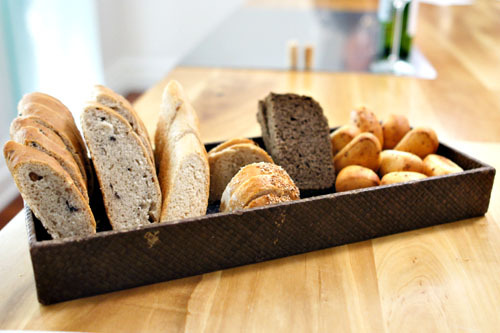 Bread, of course, is baked in-house, and varieties on offer tonight included black olive, baguette, pumpernickel, pain noir, and bacon brioche. This visually-striking plate was perhaps the most intriguing beet dish that I've ever had. The inherent sweetness and character of the root vegetable was apparent in both the sorbet and pressure-cooked presentations, but was adroitly tempered by the application of the tangy crème fraîche. 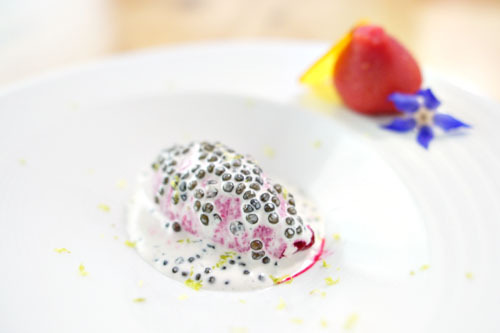 At the same time, the tartness of the kaffir and salty notes of the caviar also provided pinpoints of countervailing piquancy to offset the sugariness of the beets, making for a complex, contemplative course. Rarely does a salad excite me, but this one certainly did, inspired by the Lauragais area of France and featuring duck in various forms and facets. 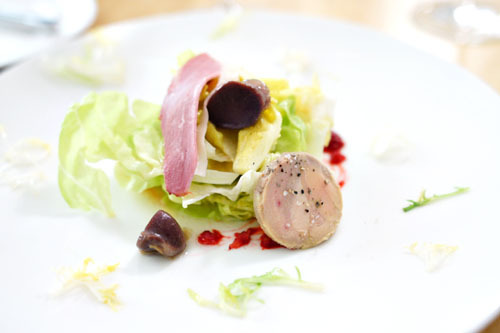 The foie gras torchon was spot on, luxurious and decadent, while the breast conveyed delectable notes of savory, smoky goodness. The star of the show, though, was the confit'd duck gizzard, which demonstrated an incredible depth of flavor that was quite unlike anything that I'd eaten before. All this heft was wonderfully balanced by the light, crisp shards of lettuce, while the salad's dressing and bits of raspberry provided bright, tangy counterpoints of flavor. 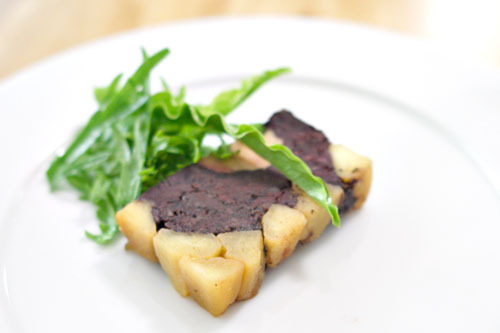 The flavor of blood sausage can be overwhelming, but here it was presented in a delicate, yet still robust manner. The boudin noir showed off its trademark earthy, metallic character, but the caramelized apples and foie did a great job in softening and complementing its flavors, while the greens provided a piquant, bitter contrast. The overall effect was a rustic, yet refined dish, making this easily the best presentation of blood sausage that I'd ever experienced. 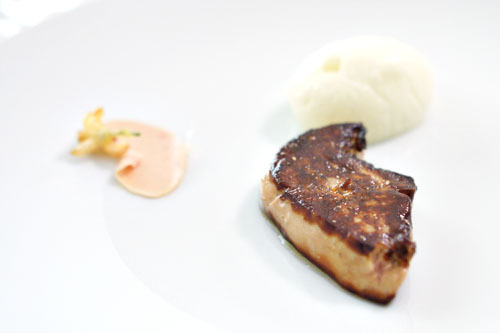 As regular readers will know, I'm often times not a huge fan of hot foie, but this might've been my favorite chaud preparation ever (the only other one that comes to mind was a version I had at Guy Savoy). Hudson Valley liver arrived seared to utter perfection, melt-in-your-mouth decadent and trembling, brimming with classic foie gras flavor and accented by pricks of salt and a wonderful astringent char. It was the epitome of the marriage between power and finesse, and easily stood alone. However, I also appreciated the additional complexity provided by the shaved raw foie and tempura'd orange blossom, while a blossom-infused espuma provided a wonderfully tart, ethereal, and almost medicinal counter to the heft of the liver. 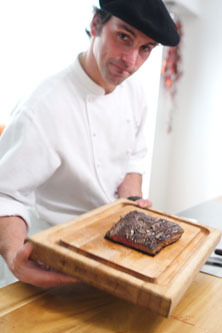 Here, the Chef pays tribute to the classic Gascon staple of home cooking, the garbure. 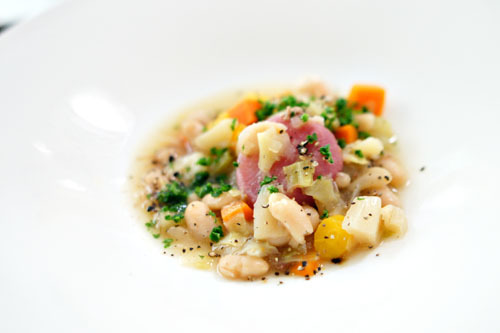 The vegetable-based broth contained cabbage, turnip, carrot, and beans, among other ingredients, and was a prime example of hearty, rustic cookery. Shreds of duck confit provided additional depth to the dish, and I also appreciated the soup's peppery bite as well. 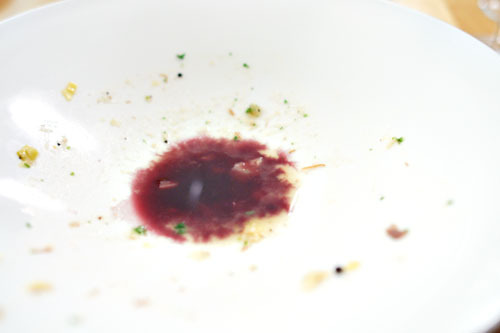 We ended this course with the Southwestern tradition of chabrot, in which we mixed red wine with the remainder of what was left in our bowls, and downed the resultant mixture. Filet of Dover sole was cooked flawlessly a la plancha: spongy, springy, and supple in consistency, with a delectably mild, savory-and-sweet relish interjected by pricks of salt. 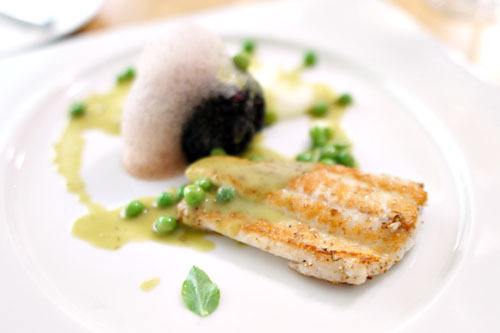 Meanwhile, a sauce of fennel pollen and peas provided a bright, green accent to the fish, while the rice and rice foam served to ground the course. A masterful presentation of sole. 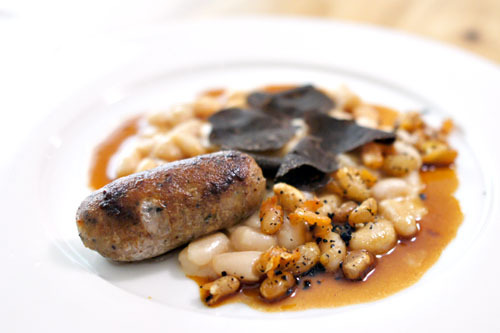 ...A reimagined, refined version of cassoulet, slow-cooked with duck fat. 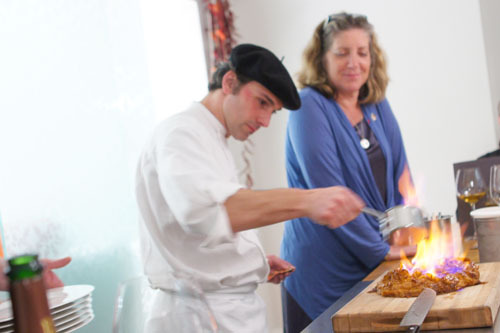 The focal point of the dish for me was the incredible white wine-poached saucisses de Toulouse, with its heady, aromatic, and profoundly savory, salty flavors. Though the sausage was the hero, I also appreciated the moderating effect of the cannellinis, while the deep-fried beans added a great textural element. 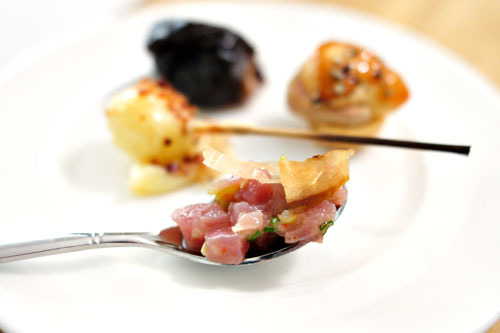 We can't forget about the black truffle, either, which instilled an overarching, integrating earthiness to the entire dish. Tableside presentation of a gorgeous slab of beef. 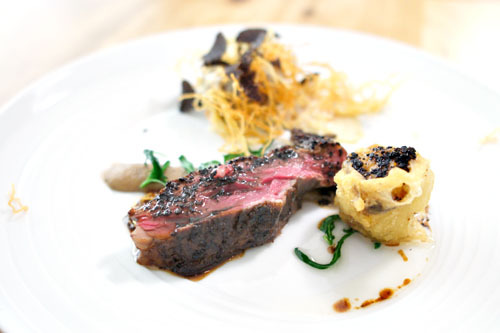 For our last savory course of the evening, Féau presented a beautiful rib eye cut of Mishima wagyu. The steak was pretty amazing--tender and barely cooked, with a tremendous beefiness and richness cut by a delightfully charred crust and wonderful saltiness. The truffle-infused perigourdine sauce, meanwhile, added a further undercurrent of savoriness to the fray that took things even more over the top. The tempura'd mushroom was a nice touch as well, but what did a really great job in balancing out the dish was Féau's signature "DFC potato," which combined a fondant, espuma, and crispy fried strings all into one. Féau's cheese courses are always interesting, and tonight he presented a hemi-disk of Cabécou chèvre from the Tour du Lot area of France, aged four days in a coating of ash. 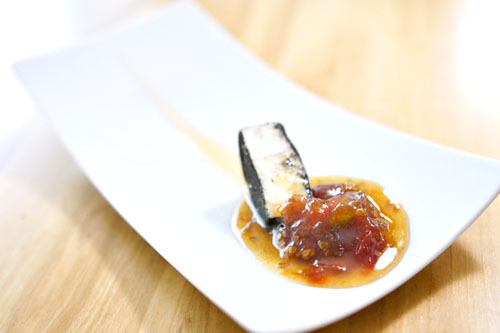 The ash gave a peppery, astringent taste to things, and worked superbly with the mild, creamy, subtly tangy goat cheese, while the tomato jam and honey supplied a perfect countervailing sweetness to the mix. 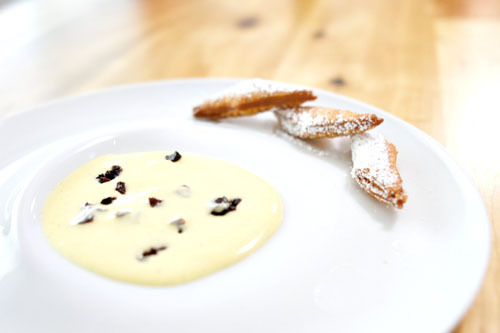 Merveilles are a type of beignet, and here they were lovely: parallelogram-shaped, crisp, and flaky, with a tasty interplay of both sweet and savory relishes and tinged with just a whisper of citrus-y aroma. They were certainly enjoyable alone, but the key to the dessert was the prune sauce, which added a wonderfully deep, saccharine smack to the mix that just paired in stellar fashion with the pastries. 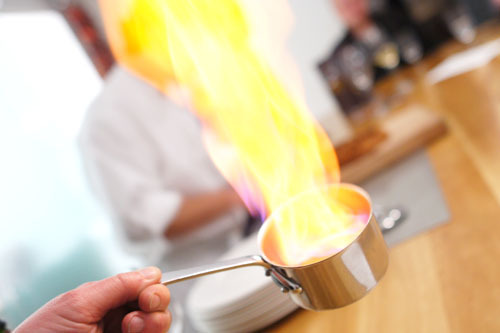 Some theatrics for our next course--a good tableside flambé is hard to come by these days! 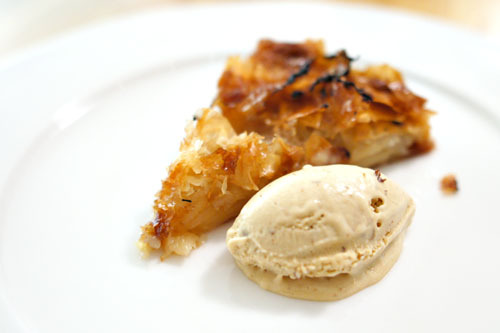 Our final course of the night brought us a pastis Gascon, a specialty of France's Gers region composed of layers of thin phyllo-like pastry sandwiched with caramelized Armagnac-soaked apples. It was a real treat, with the buttery, flaky, and slightly astringent cake playing off of the sugary, boozy apples rather nicely, all while the prune-Armagnac ice cream (I wanted to take a pint of the stuff home!) served as a perfect contrast to the pastry. 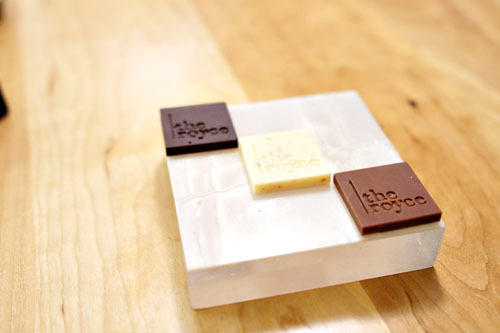 The Royce's signature chocolates included a fleur de sel dark, an espresso powder milk, and an espelette pepper white. 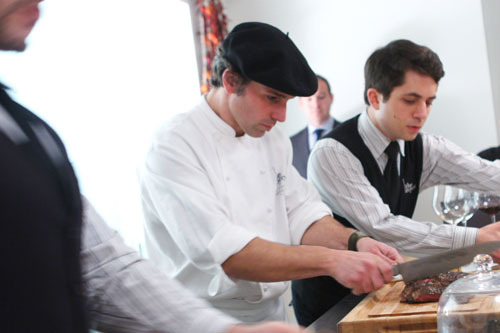 Chef Féau and company managed to outdo themselves once again, serving up a dinner that managed to put a delicious, modern twist on the culinary traditions of South West France. The Royce has been remarkably consistent over my multiple visits, and in fact, the kitchen has only gotten stronger, delivering tonight a near-flawless meal that perfectly showcased Féau faculty with refined rusticity. 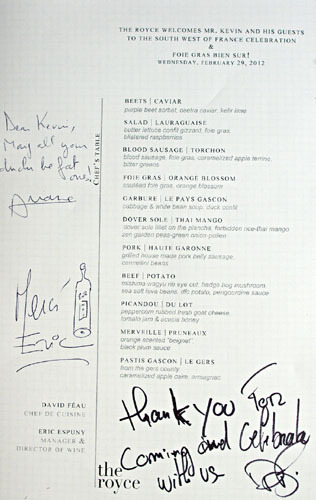 I've been a fan of the place for a while now, and it's great to see the restaurant finally get some recognition, with The Royce just recently receiving a nod from Los Angeles magazine as one of 2011's Best New Restaurants, not to mention Féau's receipt of a James Beard nomination for Best Chef: Pacific. Some wonderful things are happening over here in Pasadena. okay so The Royce has quickly jumped up a few spots on my wish list in LA. Especially if I were to get to meet Ariane Daguin. Great looking menu, do you happen to know what the standard 6 dishes were for the evening? Great post as always. It seems like this is your annual spot and I'm glad to see the progression here. Perhaps a revisit is needed. Sam: A revisit before you leave us perhaps. Too bad you can't come on Monday. Sam do you have some news to share? Leaves us? :(. Yes, Sam is relocating to Chicago.